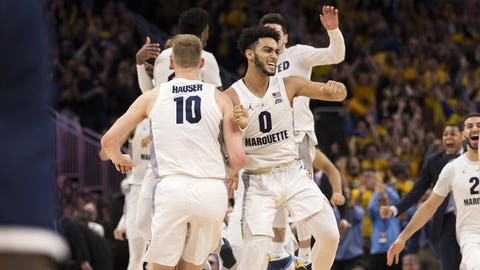 Marquette‘s season didn’t exactly end on a good note. After making it into the top 10 of the Associated Press Top 25 poll, the Golden Eagles struggled down the stretch and lost six of their final seven games, including a first-round outster in the NCAA tournament by Murray State. But there’s some good news: Marquette is thought of very highly heading into next season. As soon as the national championship game ended, writers, analysts, experts, etc., started putting out “way too early” preseason Top 25s for the 2019-20 season. The majority of those putting out such rankings see the Golden Eagles as a top-10 team — in fact, the average ranking comes out between No. 7 and No. 8 — with couple having Marquette in the top four (including one at, yes No. 2). There is one major caveat, of course: These prognosticators are going on the assumption that Markus Howard will be returning for his senior year. If Howard doesn’t come back, well, temper those expectations of course (although analysts still like Marquette, obviously they won’t like them as much). Here’s a roundup of all the “too early” Top 25s we could find, in order of Marquette’s ranking. When possible, we’ve also added in the comment each writer made about the Golden Eagles. Let this fuel your fire until October. Rob Dauster of NBCSports.com: 4. Mike DeCourcy of the Sporting News: 7. Gary Parrish of CBSSports.com: 8. David Kenyon of Bleacher Report: 13.